We have the key. You are waiting for something to open up to give you an idea of the direction you need to go in, and be clear! This is not negative. This is not secretive. It’s just… I don’t know, like waiting for a sign, like ‘Where do I go?’ Ya know? You’re on pause… that’s all that I’m getting. Fast forward to 27:14 where she gets back to that air sign and continues with this train of thought. The cage is open though. The cage is open, so you already have access to it. I don’t know what that’s about. We’ll see. OK. So I stopped the playback knowing this was for me to pay attention to. I knew I wasn’t waiting for a sign any more than usual – expecting signs all day long every day, like always. Therefore, I knew it was for me to share with someone else who needed to know. That may be you, dear reader. One of you, for sure. Otherwise, I wouldn’t have been pinged like I was – a feeling in my heart space that it was time to take notice. I realized if Veronica said I had access to what I needed I knew that meant through a message via meditation (too long and I have a short attention span at what is nearing 7pm – being that I’m hungry and haven’t eaten dinner yet, so, nope! On to the next), or pulling a tarot card (sometimes vague – and again, the niggling I wanted to get this done so I could chow down), or maybe through a song using the shuffle feature of Pandora’s music app. Yup! The app won and off to Pandora I went. Before I hit shuffle I said to myself, in my head, “What do I need to know? 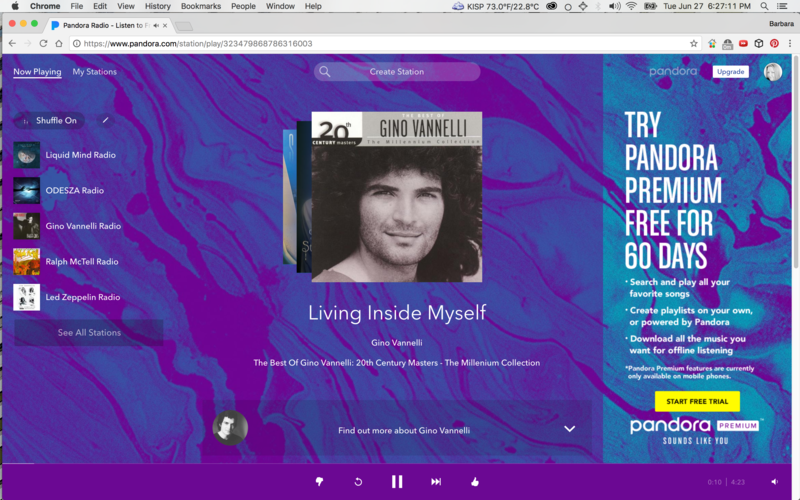 What am I suppose to share?” The song that played was Gino Vannelli’s Living Inside Myself. Video and lyrics below. Good luck friends. If this was you, I’d love to hear more in the comments section for this post. No trolls please. I’m just too busy to be bothered with your silliness.